Robert hosted a Hoppin’ John party at his house every year, and it was delicious. (It’s somewhat ironic that I now live in the South but the only place I’ve ever had Hoppin’ John was in Berkeley, California.) Robert had a mischievous and impish sense of humor, and consequently he surrounded himself with colorful and funny people. 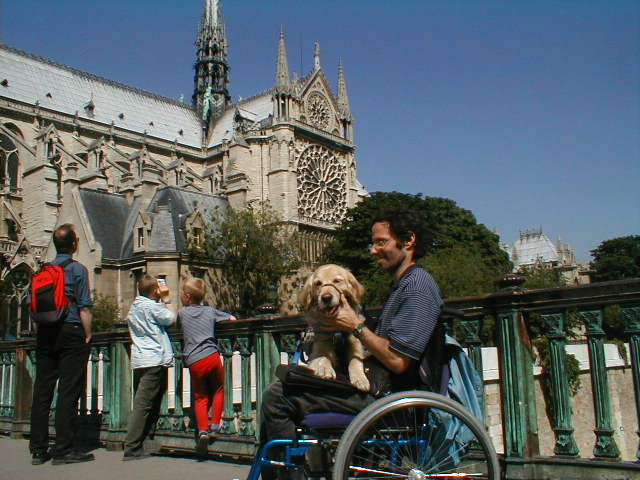 For many years Robert’s closest companion was his guide dog Bishop, who would join Robert everywhere. Bishop eventually passed away and Robert found a new canine companion named Julep. My advisor was always very supportive of me, and I owe him a tremendous debt of gratitude for helping me obtain a Benjamin Peirce Assistant Professorship at Harvard after I graduated from Berkeley. That position helped my career in immeasurable ways. More recently, Robert helped recruit me for a professorship at Berkeley where I spent a memorable year as his colleague during the 2011-12 academic year. (I eventually returned to Georgia Tech for family reasons.) It was wonderful to reconnect with him, introduce him to my kids, and meet his lovely fiancee Tessa, who he married in Summer 2012. I was very touched and honored that Robert asked me to be in his wedding party, and I’ve never seen him as happy as he looked on his wedding day. I am heartbroken for Tessa, who has been so fiercely devoted to Robert. His Ph.D. thesis “Division Values in Local Fields”, worked out when Robert was still an undergraduate and published in Inventiones. His theory of p-adic integration, introduced in his seminal 1985 Annals of Math paper “Torsion Points on Curves and p-adic Abelian Integrals”. Coleman’s theory has had significant applications to the theory of rational points on curves, starting with his Duke paper “Effective Chabauty” and continuing to the present day with non-abelian analogues due to Minhyong Kim and others. The method of Coleman-Chabauty is currently one of the best ways to explicitly calculate the rational points on a curve of genus at least 2. Coleman’s method of proof, which he calls “analytic continuation along Frobenius”, helped inspire Kiran Kedlaya’s influential p-adic algorithm for counting points on hyperelliptic curves over finite fields, which is important in modern cryptography. Coleman’s theory of p-adic integration has been generalized by Colmez, Berkovich, and other prominent mathematicians. His work on p-adic families of modular forms, introduced in his 1996 and 1997 Inventiones papers “Classical and Overconvergent Modular Forms” and “p-adic Banach Spaces and Families of Modular Forms”. These papers introduced important new methods from the theory of Banach spaces, coined the term “overconvergent modular form”, and proved an important criterion for such a form to be classical. Those papers, along with Coleman’s subsequent work with Barry Mazur constructing the so-called “eigencurve”, have had a huge impact on the theory of Galois representations. Robert Coleman was a kind, brave, and brilliant man whose influence on mathematics and on his friends and loved ones will long outlive his fragile body. Please share your memories of Robert as a mathematician and inspirational human being in the comments section below. [Note added 4/8/14] There will be a memorial service on Saturday, May 31, 2014 at the Bancroft Hotel in Berkeley from 2-4pm. People are encouraged to bring remarks, pictures, videos, etc. Please let Ken Ribet (ribet@math.berkeley.edu) and Arthur Ogus (ogus@math.berkeley.edu) know if you plan to attend, and if you plan to speak or bring any mementos. This entry was posted in Personal stories and tagged p-adic analysis, Personal anecdotes, Robert Coleman. Bookmark the permalink.